T.E.I. 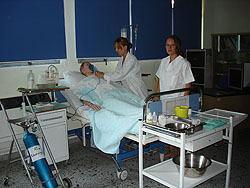 of Thessaly is located and operates in three major cities, which are capitals in the respective prefectures, in Thessaly: Larissa, Karditsa and Trikala. 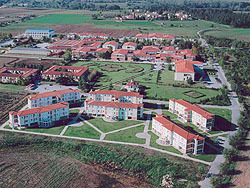 Larissa Campus is situated approximately 4km west of the city centre, on the national motorway from Larissa to Trikala. The main building block which houses administration offices and the Schools of Technological Applications, Health Care Professions, Agricultural Technology and Business and Economics. 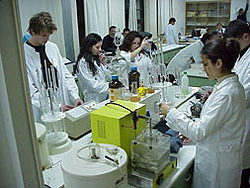 Facilities include classrooms, laboratories, Faculty offices, an auditorium and the library. Detached buildings that house the departments of Mechanical and Electrical Engineering, the department of Tourism Enterprises and the department of Animal Production, with classrooms, laboratories and Faculty offices. A multi-purpose building block with a well-equipped conference centre and the student restaurant which has a catering capacity of 3,500 people. Halls of Residence Complex for student accommodation. Sports facilities that include football, basketball, volleyball, tennis courts, etc. and a well-equipped multi-sport gymnasium including a basketball court and fitness centre. 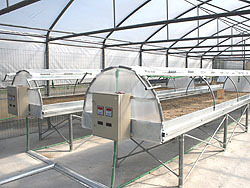 The farm which comprises gardens and animal breeding installations for the laboratory practices of Agricultural Technology School. The new Central Library building of 2,778 m2 in area which has just been completed in order to meet the educational need of T.E.I. Building A, of 4,500 m2 in area, which has just been completed and will house the departments of Project Management and Informatics & Telecommunications Technology. How to get to Larissa campus: Take the city BUS 9 or BUS 12 from the city centre. 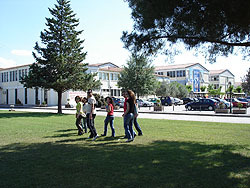 Karditsa Branch is located at its own campus with ample buildings and facilitiess such as student restaurant, library and Halls of Residence. Karditsa Municipality has recently donated a building block, of 2,770 m2 in area, fully renovated for the housing of the department of Food Technology. 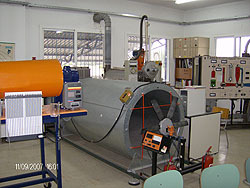 In addition, a new building for the department of Wood & Furniture Design & Technology was founded in June 2007. Trikala Branch is located at Bara precinct, approximately 700km north of the city centre, on the national motorway to Ioannina. Facilities include a newly renovated three-storey building block of 3,300 m2 which is placed in the middle of a large yard. The building comprises classrooms, laboratories, offices and the Trikala Branch Library.